Academics Pilsen victorious » COMTES FHT a.s.
On 1 March 2016, Academics Pilsen, a university team sponsored by COMTES FHT, won their match in the European University Hockey Association. They beat Diplomats Pressburg 5:4 after penalty shootouts. 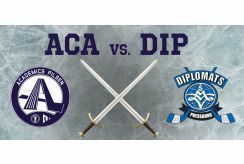 The Academics had massive backing from their fans: over one thousand students who took part in the “From the Class to the Ice Stadium” event. Keeping the spirit in the stands were Pavel Horváth, the icon of the local football team FC Viktoria Plzeň, and Jiří Pelnář, a Pilsen radio host.